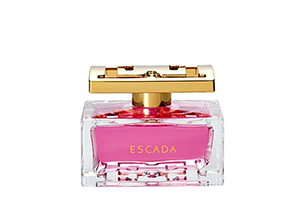 The packaging for this fragrance perfectly captures the grace of the Escada brand – the simple elegance of the solid square bottle, complemented with the golden Escada emblem on the lid, fashioned to resemble a rose. The lovely rose tone of the fragrance perfectly complements the gold accents on the bottle. The scent itself is light-hearted and feminine – sure to conjure your inner romantic. You will first experience this scent as a vibrant concoction of crisp pear and ambrette seeds. The heart accord features the scent of dewy rose petals. Base notes include white musk, Madagascar vanilla and ylang-ylang. This sparkling mood lifter is sure to elicit complements from friends and family. The only caveat is that the scent lacks longevity, fading within a few hours. This perfume is so delightful, the scent of rose captures your mood to make you feel in love, romantic etc. If you are into florals this is for you. This fragrance is soft and sensual with hints of rose. It is playful and feminine, and is perfect as an everyday fragrance. Sweet scent. Not long lasting unfortunately. Love this perfume. I got it as a gift and I’m so glad I did. It smells very subtle, not too sweet and lasts long. I like the pink colour and the bottle looks elegant.